Area of interest: Underground sites of Surrey / natural caves of Somerset. Classes of membership: Annual membership £26. Includes Public Liability insurance. Publications: News of the Weald (members only) 4 times per annum. Archive collection: Any request from non-members to access online archives considered on its merit. or access controlled: Leaders can be provided for a number of sites in East Surrey on request. Current projects:	 Discovery and study of mine workings at Merstham and Godstone, Surrey. Additional information: The Society was originally named "Unit Two Cave Research and Exploration". It was formed in 1967 from two then existing groups, hence the former title. The new name was adopted in 1990. 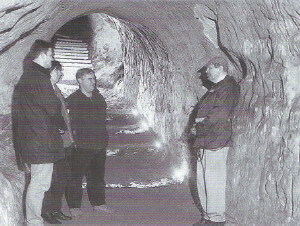 The photograph shows WCMS members in Barons Cave, Reigate for which the Society have a licence to open the cave to the public.